Selected for the Current Voices In Literature Program, 2013-14, by the Center for Literature and Theatre at Miami Dade College. Publishers Weekly says of Magpies: "Barrett portrays adult lives with minimal flourishes and a powerful command of setting. Florida is electric with the tension of "all that can happen"—hurricanes, sinkholes, and a boom-and-bust history. It becomes as eerie as it is richly imagined, whether stories take place in an Art Deco building or a gas station. One of the year's finer university press offerings..."
In The Rumpus, Joseph Olshan writes: "Sentence for sentence, Barrett is a superb writer. Her work brims with original ideas, questions and philosophical musings, the product of a probing intelligence and a highly literate sensibility. But what separates her from many contemporary short fiction writers is her consummate story-telling ability." Chauncey Mabe asks "Why does Lynne Barrett hate me?" in his review. Melissa Slayton in the Apalachee Review says, "Fans of Jennifer Egan’s A Visit From the Goon Squad or Tony Earley’s Here We Are in Paradise will enjoy Lynne Barrett’s third collection of short stories, which won the Florida Book Awards Gold Medal for General Fiction. Barrett’s aesthetic blends a wry take on contemporary American culture with a unique awareness of the Florida landscape. Within this book, one is as likely to encounter an overwrought editor as a sink hole, a gossip columnist as a tropical depression....This collection is tightly crafted yet eclectic." Emma Trelles says Magpies is "an assemblage of delightfully strange stories" in her New Times list of best things about Miami. It is entirely impossible to predict what you’re going to get when you start a Lynne Barrett story: a taut tale of adultery and murder, a wry evocation of romance among the dot.com bubble, a gossip columnist who spits toads. What you do know is that you’ll keep reading—for the vibrant prose, the keen insights, and the remarkable depth of feeling. Magpies is a stone cold triumph. Lynne Barrett belongs in the top tier of short-story writers in America today. Her unforgettable characters, poker-face wit, and sly plots make for an intensely enjoyable experience. The title story should be snapped up by anthologies. Barrett’s male characters are every bit as believable as her female characters, and the breadth of detail is both natural and mind-expanding. You want to read her work: it’s hilarious-funny and sophisticated-funny and moving-funny, and withal shines a clarity that comes from the subtle beauty of her sentences. Book Description: In Magpies, Lynne Barrett’s characters move through the past decade’s glitter and darkness. From the Internet’s fragmented pages to a gossip columnist’s sweet poison to the ABCs of a hurricane season, these tales explore story form and storytelling as a means of connection, betrayal, and survival for characters who learn, sometimes too late, the value of what’s grasped and what’s lost. 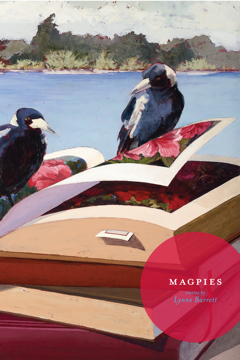 The cover image for Magpies comes from a painting by artist Sterling Mulbry. Magpies is published by Carnegie Mellon University Press and distributed via University Press of New England. In March 2012, Lynne received the Gold Medal for General Fiction in the Florida Book Awards, for Magpies, at the Florida Heritage Awards Ceremony in Tallahassee. This press release includes some thoughts about winning the award. 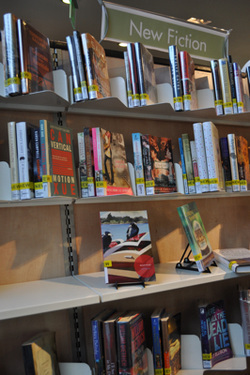 Learn more about the Florida Book Awards here. The book launch at Books & Books in Coral Gables, FL is described in this great blog by Geoffrey Philp. Santa Monica Library. Photo by Mel Ryane. Why Magpies? You can read how Lynne got to this title over on the blog. Dena Santoro has written an appreciation of the (bad) girls in Lynne' short stories, at Like Fire. Laura Richardson's interview with Lynne about Magpies, plot, editing, and more is here at Sliver of Stone. Chauncey Mabe asks: "Why does Lynne Barrett hate me?" in his review of Magpies. "If I were world dictator, Lynne Barrett would be locked in a room and forced to write one of her patented stories before being let out for brief periods of air and exercise . . . Barrett writes with such inventive insight, such respect for her characters, even the most flawed, that it comes across as clear, compassionate, and, for me at least, exhilarating.”"
Casey Pycior interviewed Lynne for his blog, The Story is the Cure. Among other things, we discuss how my story "Links" got inadvertently linked, and then delinked, online, unanticipated consequences of writing about the dot com world. Necee Regis interviews Lynne (and compares reading the collection to eating Belgian chocolates) at Beyond the Margins. Angela Kelsey has done a four-part (they're short!) interview with Lynne on her blog. Topics covered include how a writer transforms bits of the past, use of place, how suspense is created in literary stories, and tips for writers. Lynne's WLRN Topical Currents Interview can be heard by going to the About Lynne page or downloading the full show's MP3 here. Miami author Lynne Barrett has done much for the literary community around these parts, as both the founding editor of Gulf Stream Magazine and the founder and editor of the Florida Book Review. Her third collection of short stories melds various styles and subjects, from the dot.com bubble (written with actual links in hyperblue, underlined font) and a sort of magical realism story about a gossip columnist — tales delineating the last decade's rapid move from boom to bust in an aesthetic of prose that's just as unpredictable as the times Barrett is describing. On her website, she writes: "...there are two human sides to magpie acquisitiveness: we can identify with the stubbornness of unreasonable desire, but we also fear it in others."